Lets get down to business, shall we? Get it? Business? Suite? Oh geez…so bad…so sorry! Need more coffee! If someone were to ask me to describe my style in one photo, this would be IT. Nothing dramatic or fancy… kinda boring. But, this is me. I hope you are having a wonderful week so far, and as always, thank you so much for dropping by! I’m linking up with today. So many lovely ladies…check them out! You look very elegant ! what a great suit. very classy! nice touch with the pearls and what a fabulous bag!!! LOVE! There are so many floral prints around at the moment but I do simply adore black and this look is powerful and chic. Perfect. I feel as tho I should be in “Men In Black” movie! LOVE the shape of your trousers, such a perfect cut! a total black look is so stylish on you !!! Ah…yes! A fresh white suite for Spring/Summer sounds wonderful! I can’t wait to see what you find! 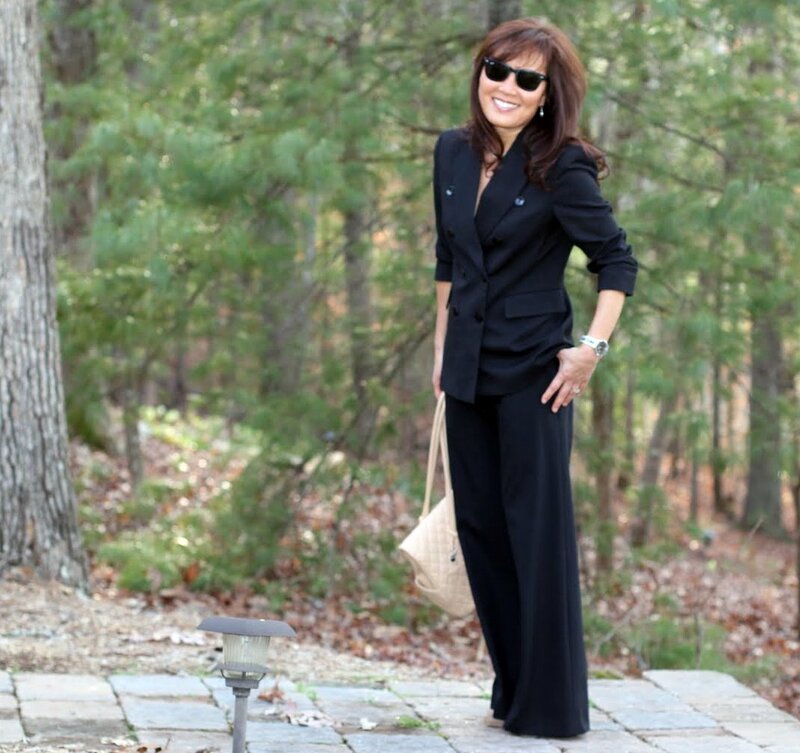 Oh yes, the 3 c’s of the little black dress..or pants suit……..cocktails, church and cemetery! I’ve done all 3 with any number of black items in my closet. I’ll have to remember the 3C’s! Black, comfy and extremely classic. Yep! You can pretty much wear anything with black. No brainer for me! I only have few wide leg pants, but I like them! Yeah…black, brown…love neutrals! Black always works! Dressed up, or down, always classic. You look like a movie star! You are rocking that incredibly fabulous suit! love the double-breasted suit! i wore out one of these a few years ago — and this reminds me i need to find a new one! looks great! Just think, we could go shopping for boots and suit together if only we lived in the same State! I’d definitely meet you for a drink and a day of shopping! Perfect suit trousers…I love the silhouette. 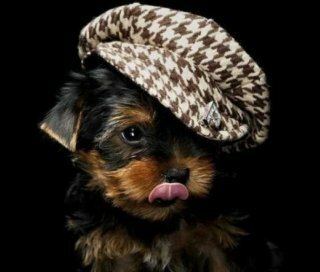 Kisses to your darling doggies!! Black is always chic and classic, which you prove is spades. I’m partial to neutrals myself and reach for them almost everyday. Confidence is the best accessory any woman can have, with that Chanel bag being a close second! Love to you! I’m gonna call you my cyber sista! I envy anyone who looks that good in black! With my pale complexion it makes me look like a corpse! I’m much better in a charcoal grey or dark brown. Hehe…I doubt you’d look like a corpse. I love shades of grey & brown as well! I’m most comfortable with neutral colors anyway. You’re not boring, your style is fantastic. Again I love the bag. Your closet has no end? Great fit and classic style is NEVER boring! I love the way the pants flow and the jacket fits…this is a fabulous suit! Do not ever apologize for great tailoring and timeless looks. You look fablous! I don’t think this look is for everyone, but it pretty much describes what I love. Simple & classic. 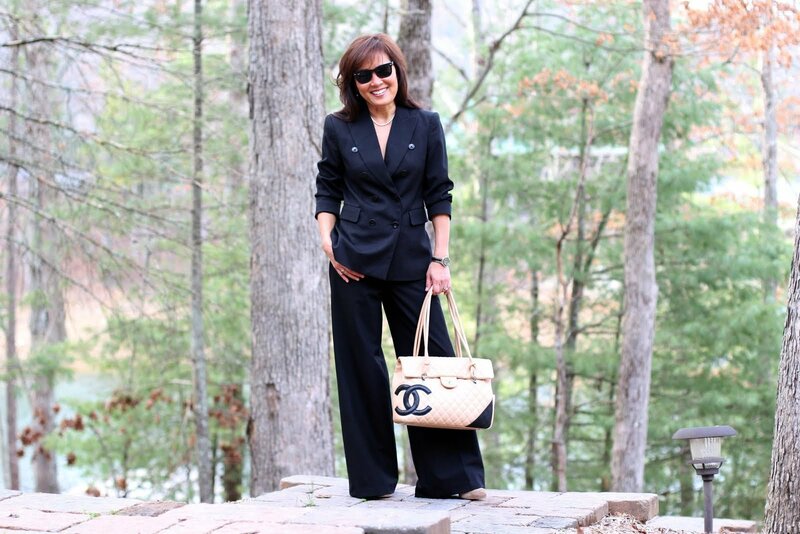 Yes, I think black is flattering for most people and versatile, too!